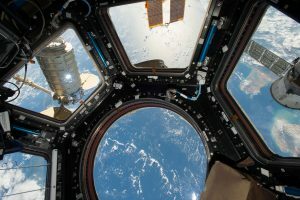 ‘Plants in Space’ sounds like it could be the title of an upcoming science fiction blockbuster or a lost David Bowie track, however the study of how plants survive space travel is a bustling field at the moment. Advances in space travel have made it possible for our continued steps in exploring our solar system. Growing plants on board space-faring vessels or in established colonies will help us survive long journeys for a variety of reasons. Having plants growing off-world can help rejuvenate air, supply food, and provides a critical connection to the planet such expeditions leave behind. Extraterrestrial gardens are not as simple as you might think, however. Equipment used for space travel is forced to be as small and light as possible, leading to even the most lavish space plot being able to house only a few plants each grow cycle. At the same time otherworldly forces found in space, like microgravity, act on plants in mysterious ways. As we take to the stars on long and dangerous journeys, it is of critical importance that we learn how to also bring other forms of life with us in order to better weather the dangers of the great beyond. While a current hot topic, the study of how plants are affected by space is not new. In the 40s the US launched some seeds into space and made them the first organisms blasted into orbit. By the end of the 60s we had launched and recovered 3 research satellites crammed full of a variety of organisms including plants. It was difficult to assess the true impacts of space travel on plants until astronauts were able to care for and directly observe them, however. This didn’t happen until Russian cosmonauts began to grow pea and mustard plants aboard their cramped Salyut space station in the 70’s. While most of their plants died, the resident cosmonauts became so attached to the survivors that they were hard pressed to leave their new green friends. These first space plants were grown mostly for research purposes. They performed wonders at raising crew morale as well, however, and served as a literal growing reminder of the planet the crew had left behind and that they were working to improve. Plant studies aboard the various space stations have expanded over the years, with the US beginning major studies in 1999. The space station was recently upgraded with its largest ever plant chamber. This fully automated greenhouse is about the size of a large microwave and is equipped with multiple LEDs, sensors, and watering systems. While these tiny space farms give astronauts little room to stretch their green thumbs, the data they are providing is helping scientists figure out the unique obstacles that future astronauts will need to surmount when growing plants in space. There are several main problems that plants have when it comes to growing off-planet. Low or nonexistent gravity, cramped quarters, artificial light, and unique growing methods all serve to affect space plants in a variety of ways. Small, artificially lit chambers usually lead to small plants which are susceptible to damage in the case of poor air circulation or watering issues. Soil is often deemed too heavy for transport, and is usually substituted by either baked clay or hydroponic systems. This leads to plants that end up missing out on the benefits that microorganisms in our soil provide, including increased nutrient and water absorption. Many plants have internal mechanisms that also depend on the effects of gravity in order to function properly. Root and seedling growth is affected by low gravity, and scientists have even detected changes in plant cell walls due to being in space. Hopefully these are only small issues, however, as plants are the perfect solution to renew air, recycle waste, and provide food for future space travels.